Since purchasing my Instant Pot, I’ve tried out plenty of savory recipes, meat that falls off the bone, soups, stews, beans and more. 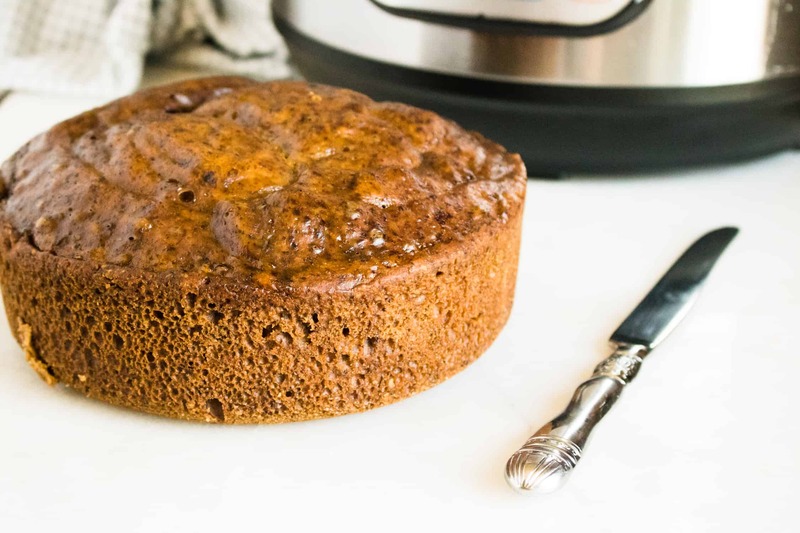 After getting several recipes under my belt, I decided to venture into the realm of the sweet and make this Instant Pot Banana Cake. 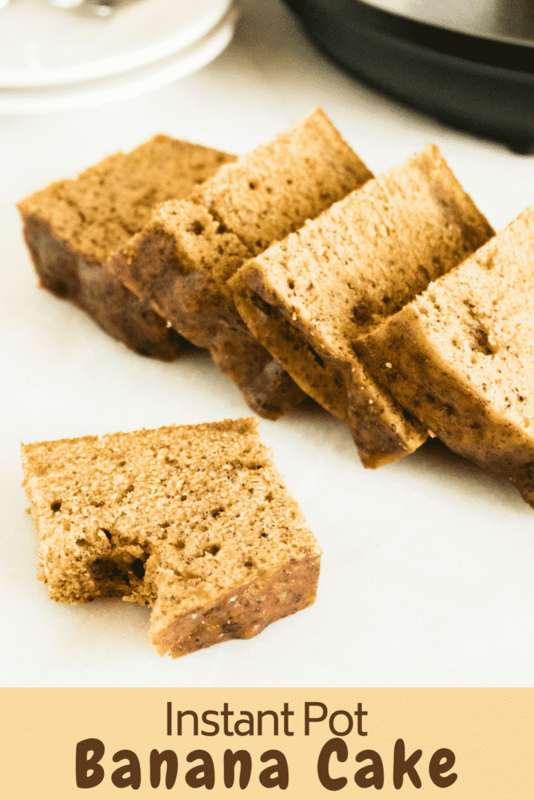 There are plenty of recipes out there for Instant Pot cakes, but this Instant Pot Banana Cake is quick and easy. The combination of bananas, heavy cream and brown sugar make it rich and tasty. Baking a cake in your Instant Pot takes roughly the same amount of time as in an oven, however the temperature is lower when steaming. This is because moist air transfers heat more effectively. How Do You Bake a Cake in the Instant Pot? It might seem strange to steam a cake, but the results are amazingly moist and rich. In many places around the world, an oven isn’t a standard appliance in the kitchen. Rather than baking a cake in a Western-style oven, use a steaming method to “bake” all types of cakes and breads. In order to “bake” a cake in an Instant Pot, you need to do a little prep work. First, you need to have a baking dish that fits inside your pot. The size will depend on your Instant Pot model, but for this recipe we recommend a 2 to 3-quart soufflé dish or mold. And, just as you do in traditional baking, make sure you thoroughly grease the dish. Next, prep a steam bath by placing water and a trivet in the bottom of the pot. Once the cake mixture is ready, pour it into your dish and place on top of the trivet inside the Instant Pot. Once your cake is steamed, it can be tricky to remove from the pot. One way to make this easier is by making a sling out of foil to allow the mold to be lifted out of the Instant Pot. Tear off a piece of foil that is long enough to wrap around the bottom of your mold and go up the sides. Fold the foil in thirds on the long end, making a wide three-piece-thick strip of foil. Place this sling under the mold, allowing it to go up the sides. When your cake is finished steaming, you can use this sling to easily pull the cake out of the Instant Pot. 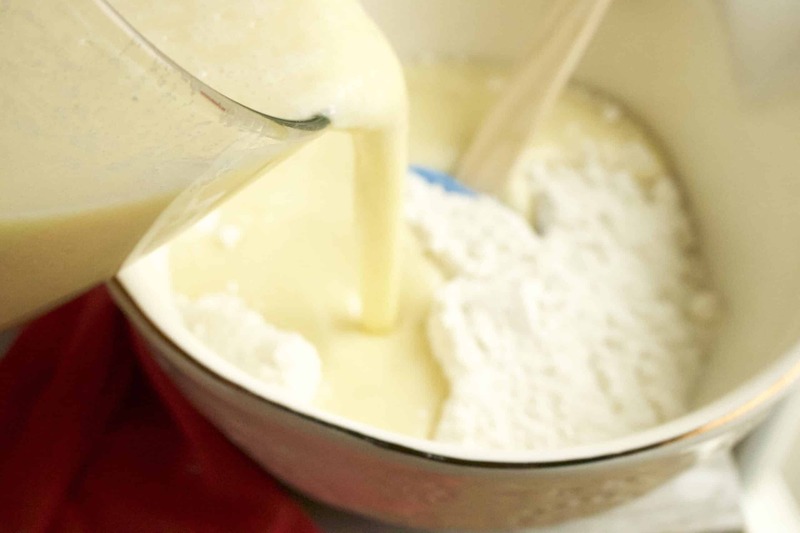 Blend together butter and sugars, eggs, heavy cream and vanilla extract in blender. Combine flour, baking powder, soda, and salt together. Pour in the blended mixture. Spoon in to a 2 to 3-quart soufflé dish or mold (sprayed with non-stick cooking spray) that will fit into your Instant Pot. Place a small trivet (or fashion a little “ring” from aluminum foil) in the Instant Pot and add 1 ½ cups of water. Then set the baking dish on the trivet. Close lid and set valve to sealing. Set on a manual high pressure cooking time of 60 minutes. Allow for a natural pressure release for 15 minutes, then let the rest of the pressure out if there is any remaining. Use hot pads and the trivet handles to lift the cake dish out. Set on a wire rack to cool. Once the cake has cooled, it should easily release onto a plate for serving. Enjoy! 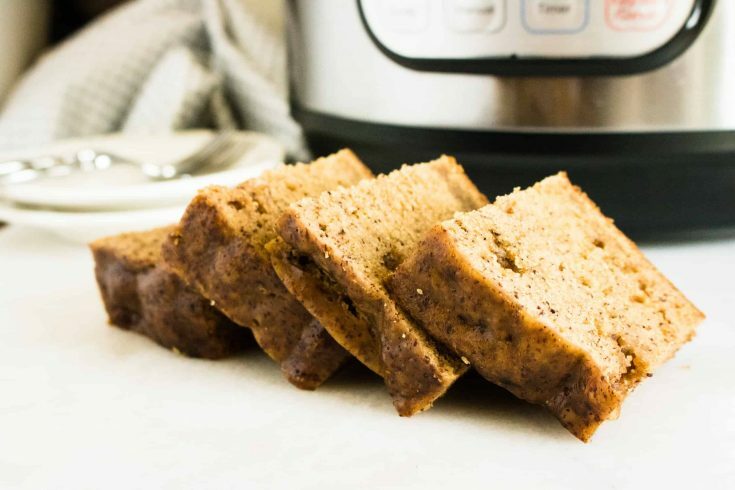 Instant Pot Banana Cake is quick and easy with plenty of bananas, heavy cream and brown sugar to make it rich and tasty. 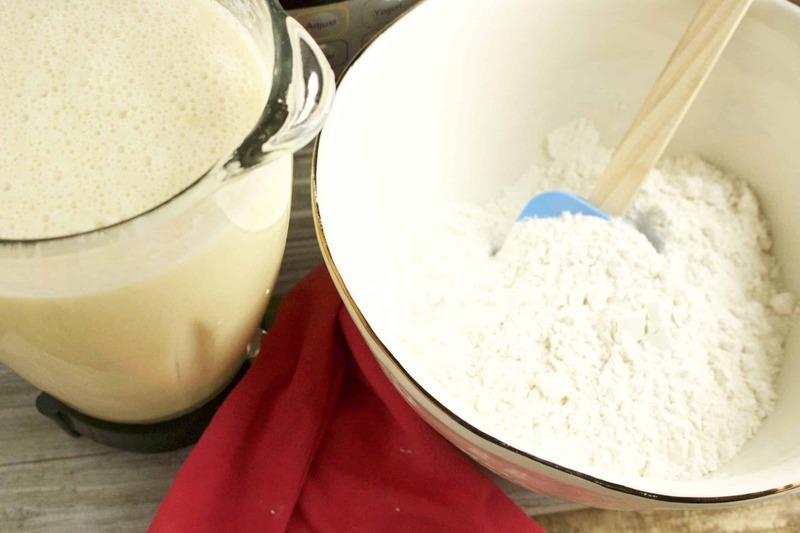 Combine flour, baking powder, soda, and salt together and pour in the blended mixture. Place a small trivet (or fashion a little “ring” from aluminum foil) in the Instant Pot, add 1 ½ cups of water, and then place the baking dish on the trivet. Allow for a natural pressure release for 15 minutes, and then let the rest of the pressure out if there is any remaining. Use hot pads and the trivet handles to lift the cake dish out of the pressure cooker and set on a wire rack to cool. Once the cake has cooled, it should easily release onto a plate for serving.